Did you know that 74% of American adults are affected by crooked or misaligned teeth? If you fall into that percentage, there’s no reason you need to stay there. Now, there are more options available than ever. Because they are clear, most people won’t even notice that you’re wearing them. The aligners are made with a smooth and comfortable plastic. 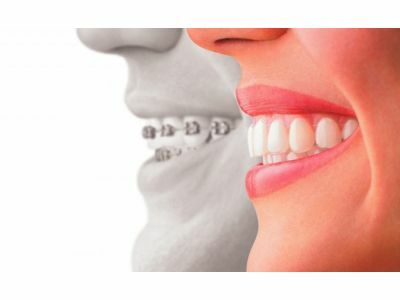 There is no chance of hurting your mouth or cutting your lip as you may with traditional braces. It’s a great option for teens as they can remain involved in sports or play a musical instrument. Aligners are completely removable at any time, allowing you to take them out for a big event, for family and senior photos, or to put in a mouth-guard. Easily clean the aligners and your teeth. Rinse the aligner daily in warm water, and brush and floss your teeth as normal. When wearing braces, your teeth cleaning time can take up to 30 minutes. Cleaning when wearing Invisalign does not extend your normal brushing time and allows for teeth to remain healthy. As an added bonus, eat whatever you’d like! With Invisalign, you no longer have to avoid chips, pretzels, crusty breads, apples… Take the aligners out when eating, and eat as normal. The length to wear the aligners varies with every person, based upon what you would like corrected and how severe the problem is. In most cases, treatment lasts a year or less. And if you’re worried about the cost, you should know that Invisalign is of similar price to traditional braces and is covered under most dental insurance plans just like they do other orthodontic treatments. Plans can cover up to $3,500 in treatment, and we can work with you to create a monthly payment plan. It could be much more affordable than you may think. At Halonen Family Dentistry in Battle Creek, we will help talk you through every stage, making sure you have a comfortable and positive experience. Feel free to discuss Invisalign at your next appointment (or set one up especially to discuss this! ), and we can figure out how to make a plan that best suits you and discover an estimated cost based on your specific insurance plan.